As the sun begins to rise on a hot August morning, most people are still asleep, but Willie Chalfant isn’t like most people. 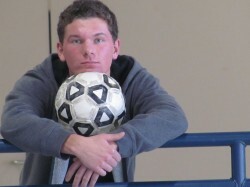 Willie is a senior at Penn Manor high school and is the star of the Comet’s boys soccer team. Chalfant has been a captain on the team for four years and is known for his hard work and dedication to the soccer team. “Willie is a hard worker whose love for soccer is contagious,” said teammate Austin Rowley. Although Penn Manor has struggled over the past few seasons, Chalfant has been an LL League and state standout. This season Chalfant was the LL League MVP and was selected to both the All State and All Region team for his performances this season. Over the four years Chalfant was at Penn Manor he scored 33 goals and had 22 assists. Chalfant also played for club teams such as MAYS, Lanco United, Lower Merion and Penn Fusion soccer clubs. Chalfant also plays for the Olympic Development Program. Pete Bournelis, the coach for Lanco United, has been Chalfant’s mentor for the last seven years. “Pete is definitely a huge part of my success in soccer,” said Chalfant. Outside of soccer, Chalfant is an average 17-year-old. He is a soccer referee year round both outdoors and indoors at Red Rose Arena. When Chalfant has a free moment off the field he enjoys hunting and fishing. As the school year is coming to a close, some students are unsure about their futures. Chalfant, on the other hand, is ready for next fall. “I can’t wait to play soccer at Temple. I am ready to compete at a higher level of competition,” said Chalfant. You never elaborated on that? ?